GD Dorigo’s production philosophy is based on a commitment to quality and safety constantly developed day after day. 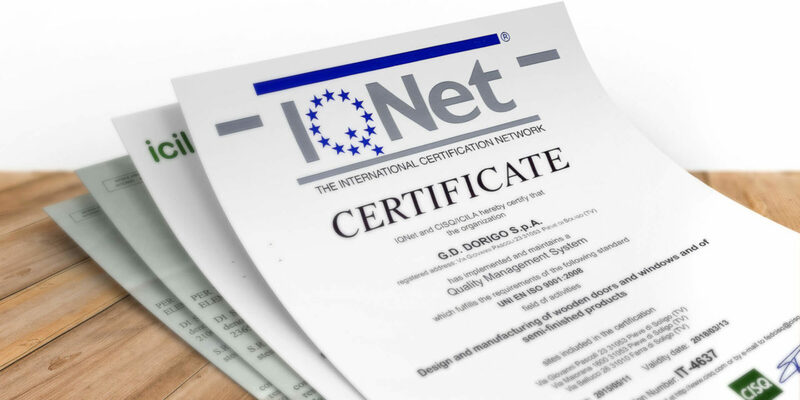 An authorised institute working to international standards has acknowledged that GD Dorigo operates a corporate system certified to UNI EN ISO 9001: 2008 standards.The whole productive process is constantly monitored with specific product test made by the Catas accredited laboratory that guarantees the conformity to the rigorous standards. Such certification officially confirms the opinion of customers who have always appreciated the company’s products and services also regarding the soundproof doors. Furthermore, careful controls and laboratory tests ensure that the doors can be cleaned with the most commonly used detergents and polishes and check adhesive durability and resistance to scratches and humidity. GD Dorigo’s System is all this and much more: quality and safety are built up day by day.